This is an early promo shot for Twilight, when they were still doing costume and makeup tests. …And here’s Alice wearing it in the actual film. But wait! There’s more! Look at what Rosalie is wearing behind her. Does that scarf and jacket look familiar at all? Yep: it’s Alice’s coat and scarf from the field trip scene! 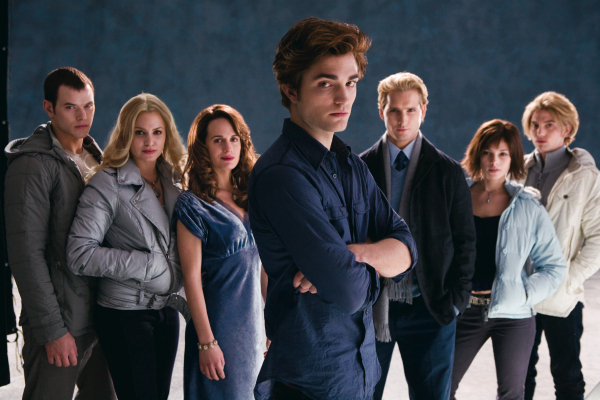 I guess that in this economy, even the Cullens have to share clothes. Now if I could only figure out where that navy blue jacket came from!! I want it SO bad. OMG that’s too funny and so true!